Design for Safety (DfSa) provides design engineers and engineering managers with a range of tools and techniques for incorporating safety into the design process for complex systems. It explains how to design for maximum safe conditions and minimum risk of accidents. The book covers safety design practices, which will result in improved safety, fewer accidents, and substantial savings in life cycle costs for producers and users. Readers who apply DfSa principles can expect to have a dramatic improvement in the ability to compete in global markets. They will also find a wealth of design practices not covered in typical engineering books--allowing them to think outside the box when developing safety requirements. Design Safety is already a high demand field due to its importance to system design and will be even more vital for engineers in multiple design disciplines as more systems become increasingly complex and liabilities increase. Therefore, risk mitigation methods to design systems with safety features are becoming more important. Designing systems for safety has been a high priority for many safety-critical systems--especially in the aerospace and military industries. However, with the expansion of technological innovations into other market places, industries that had not previously considered safety design requirements are now using the technology in applications. Design for Safety is an ideal book for new and experienced engineers and managers who are involved with design, testing, and maintenance of safety critical applications. It is also helpful for advanced undergraduate and postgraduate students in engineering. 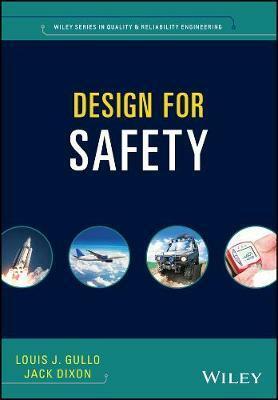 Design for Safety is the second in a series of "Design for" books. Design for Reliability was the first in the series with more planned for the future. LOUIS J. GULLO works for Raytheon Missile Systems, Engineering Product Support Directorate (EPSD), in Tucson, AZ. He is a member of the technical staff and the technical leader for Software Reliability and Safety across Missile Systems. He has worked in the industry for 33 years. He retired as Lieutenant Colonel from the US Army Signal Corps. JACK DIXON is President of JAMAR International, Inc., in Orlando, FL. He has worked in the defense industry for over 45 years in the areas of system safety, human factors engineering, logistics support, program management, and business development.